How many times have we seen this gut-wrenching scene, felt ashamed and then gone about our business after throwing up our hands in a gesture of resignation? Not any more, a young band ofdo-goodershas declared. No sooner had the first lot of used, disposable plates arrived, he rushed in to grab every morsel of food he could lay his hands on. Then, he ate as if he had forgotten when he had taken his last meal! 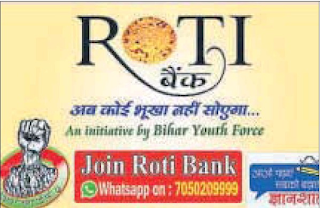 Just days after Prime Minister Narendra Modi talked about Roti Banks and how this concept could mitigate or at least contribute in mitigating hunger from the country, the first such bank is all set to roll out in Patna. Rishikesh Narayan, a research scholar at Patna think tank AN Sinha Institute of Social Studies, is ready to float the ‘bank’ which will work on the principle of collecting food from well-meaning citizens and distributing it among the destitute. 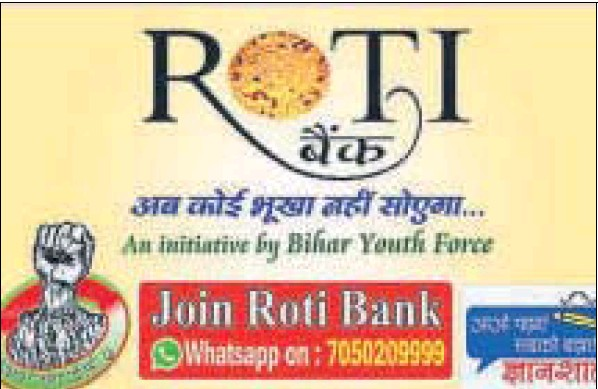 Narayan, who runs the Bihar Youth Force (BYF), a community that works for the welfare of society, is all set to start the ‘bank’ on June 15, with 50 active members and volunteers ready to set it rolling. “We hope to tap food from people who are willing to contribute a minimum of two chapatis and some vegetables to the bank every day, which will be distributed among the needy people, especially at the railway station, hospitals and footpaths of the city,” he explained. Narayan said BYF volunteers would go door-to-door to collect food from people, who could become members free of cost by joining a WhatsApp group and filling up a simple form. “More than 50 people have already joined the group,” he said. The BYF will accept the donated food, only vegetarian, in tiffin boxes. “We will allot two tiffin boxes to each member in which he/she will collect the food,” said Narayan. Each volunteers and members will also get an I-Card and a unique code of identification. Collection centres will also be opened in many areas of the city for good Samaritans to donate food whenever they wanted, even without being a daily member. In the 31st edition of ‘Mann Ki Baat’ last month, the PM had praised the youth taking part in the ‘Roti Bank’ initiative, which first came up in 2015 and later spread to several cities of the country. Narayan said, “We will ensure that the food quality is very good. We will fix a time for distribution of food. We will begin by distributing food at the Patna medical college hospital, Patna Junction railway station and footpaths of Patna, between 8 am and 9 pm”. Nobody would go with an empty stomach, he promised. Narayan said BYF volunteers had spoken to the managements of some popular hotels of the city to contribute to the campaign by donating food cooked over and above the actual demand, on a particular day.